Vice President Mike Pence said Thursday the federal response to Hurricane Harvey's devastating effects in Texas will be swift and the government is prepared "to help communities recover." Pence was joined at the news conference in Corpus Christi by Texas governor Greg Abbott as well as Secretary of Labor Alex Acosta, Secretary of Transportation Elaine Chao, Secretary of Energy Rick Perry, Secretary of Veterans Affairs David Shulkin and Acting Secretary of Homeland Security Elaine Duke. Harvey has caused unprecedented flooding in Texas, particularly in the Houston area. Overall, the storm has affected more than a quarter of Texas's population and damage estimates have been forecast for up to $30 billion. Harvey's 52 inches of rain set the record for the heaviest tropical downpour ever recorded in the continental United States. Echoing President Trump's remarks on Tuesday, Pence expressed hope "to work together on a bipartisan basis" with members of Congress to provide quick federal relief to the victims of the hurricane and said that the White House has "already been in contact" with lawmakers. "We expect Congress to move quickly on the initial legislation," Pence said of a potential supplemental appropriations bill. Pence also added that millions of dollars have been distributed in individual federal assistance and urged Texans affected by the storm to continue to apply for disaster relief online. "I say you are in our prayers and in our hearts," Pence said to Texans on behalf of Mr. Trump. Each cabinet member assured that their individual agencies are doing everything in their power to provide varying forms of relief to the residents of Texas. The vice president acknowledged that while the recovery efforts in Texas will be long-term, he hope to "get people back in their communities, get people back on their streets as quickly as possible." The group also traveled to the small coastal town of Rockport, Texas, one of the first areas hit by Harvey, to visit with Texans facing the aftermath of the storm at the First Baptist Church of Rockport. Pence spoke to a small group of state and local officials as well as community members gathered outside of the badly-damaged church. "President Trump sent us here to say we are with you, the American people are with you," Pence said. "You've inspired the nation by your resilience and your courage," he later added. Pence's wife, Karen, led everyone present for the brief remarks in prayer. Afterwards, Pence and his wife visited a nearby neighborhood and donned workers' gloves to help clear debris from the storm. Mr. Trump and first lady Melania Trump visited Corpus Christi and Austin on Tuesday and plan to return to the state on Saturday. They may also visit areas of Louisiana affected by the storm as well. Pence acknowledged that recovery efforts following Harvey will be long-term but expressed hope to "get people back in their communities, get people back on their streets as quickly as possible." He said that rebuilding the state will likely take years. Pence said that while President Trump's top priority in Texas is rescue and recovery efforts, he hopes "to work together on a bipartisan basis" to fund recovery efforts in the flooded state. Pence urged Texans affected to apply for federal support adding that "help is on the way." Both Pence and Duke advised that registering for disaster assistance online is the most efficient way to receive individual relief from the storm. "Register as quickly as possible," Abbott added. When asked how relief efforts will be funded, Pence said that the White House has "already been in contact" with Congress for a supplemental appropriations bill. 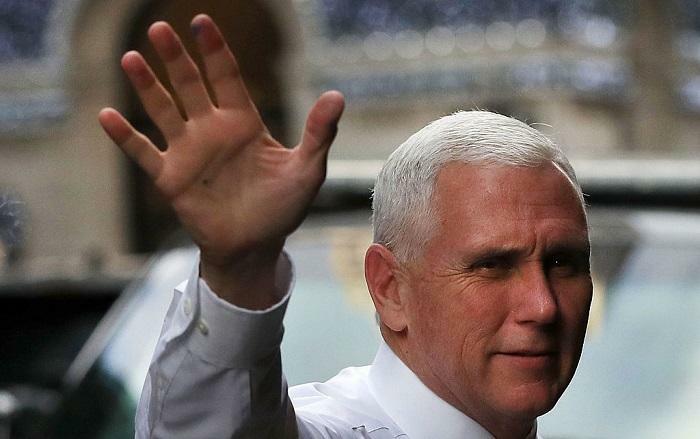 "We expect Congress to move quickly on the initial legislation," Pence said. Chao said that the Department of Transportation is working on opening or partially opening airports in Texas as floodwaters begin to recede. "Our crisis center is manned 24/7," Chao said. She signed an executive order at the request of Abbott waiving the requirements to allow expedited fuel deliveries from 25 surrounding states to help deliver fuel to Texas. Elaine Duke has "hope of the recovery"
Acting Secretary of Homeland Security Elaine Duke pledged that federal government, non-profit communities and congressional support will help rebuild the state. "Find a way to get here," the vice president urged Americans. "I say you are in our prayers and in our hearts," Pence said on behalf of Mr. Trump. After thanking Abbott and the various cabinet members traveling with him, Pence said that his visit was primarily to view the wreckage of Hurricane Harvey and "to help communities begin to recover." Pence acknowledged that Mr. Trump and his wife plan to return to Texas on Saturday after their first visit to the state on Tuesday. Pence and Abbott approached their podiums to begin remarks regarding Hurricane Harvey's effects on Texas. "I am so proud of the way that the president and the vice president and their entire cabinet have stood up, stood strong," Abbott said. Abbott said that he has been in close contact with President Trump, Pence and cabinet members since the storm began and in wake of its devastating effects.